Braniff presents "Conceptual Frameworks for Understanding Global Jihadism"
To combat Global Jihadist terrorism, Bill Braniff said you must first understand how it is intertwined with ideology, history and politics. In a recent lecture at START, Braniff discussed the breadth of the Global Jihad, citing that it is a multifaceted and dynamic phenomenon. Al-Qai'da, he said, positions itself at the center of a larger violent ecosystem. "You have to consider al-Qa'ida in context to fully understand why it does what it does," said Braniff, Executive Director of the National Consortium for the Study of Terrorism and Responses to Terrorism (START), during his July 3 talk, "Conceptual Frameworks for Understanding Global Jihadism." Understanding al-Qa'ida's relationship to the larger Muslim community requires a grasp of how the organization attempts to garner legitimacy. Al-Qa'ida sits on the periphery of Islam, acting outside of Sunnism despite cloaking itself in "seemingly unassailable Sunni terms," Braniff said.Understanding why al-Qa'ida's narrative resonates with its small number of adherents requires a historical perspective. "Al-Qa'ida has inherited a militant argument that has surfaced at various moments of crisis in the Sunni world. Al-Qa'ida tailors that historically contingent argument for the current geo-political environment, cites ideologues who made the argument in the past, and then amplifies that message, framing it as a universal truth," Braniff said. To understand its organizational behavior, one must understand the fluid and competitive political environment in which al-Qa'ida exists. Like any other political actor, "al-Qa'ida's interests align to varying degrees with other Islamist actors as their environment changes around them. What may look like meaningful collaboration in the short-term or agreement on a specific issue often changes into violent competition. "In the end, al-Qa'ida is competing for the next recruit, the next donor dollar, and the ability to influence events around them." A similar dynamic is at play online, where Al-Qa'ida's presence allows it to recruit and disburse material among potential adherents across the world. However, al-Qa'ida is now "one elitist voice among a very crowded virtual landscape that creates a more populist Global Jihad," Braniff said. 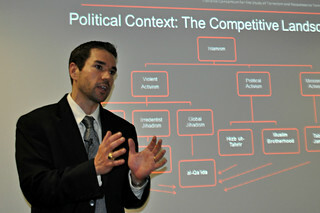 "I believe it is important for counterterrorism professionals and terrorism scholars to be able look at groups like al-Qa'ida through different lenses in order to tease apart different actors in the violent jihadist landscape, to understand the dynamic relationships between militant movements and larger constituencies, as well as to see beyond the rhetoric of militant organizations," concluded Braniff.